It grows better in rocky, disturbed soil like roadsides, in full sun or partial shade. We have one that’s thriving in the garden, though, in mulched earth and letting it go to seed to see if it can be cultivated because if you only have one plant you can’t really make full use of it. You really need a patch to harvest at different times. First year plants are a rosette of leaves only but their roots are edible, but if you pull the entire root, the plant won’t be around for a second year. However, most foragers find the root more valuable, it reportedly being medicinal for ailments like digestive disorders or skin conditions like psoriasis. From the second year growth, you can cook and eat the stems like you do with rhubarb and, of course, the root. Harvest the stems when they are no more than a foot or two high. By the time the plant is more than a few feet high, the stems become woody and stringy, but the plant will produce the flowers – their thistle-like burs – that you need for it to go to seed. Once it has gone to seed, you can use the seeds to try and propagate a patch of more than one plant for future years. 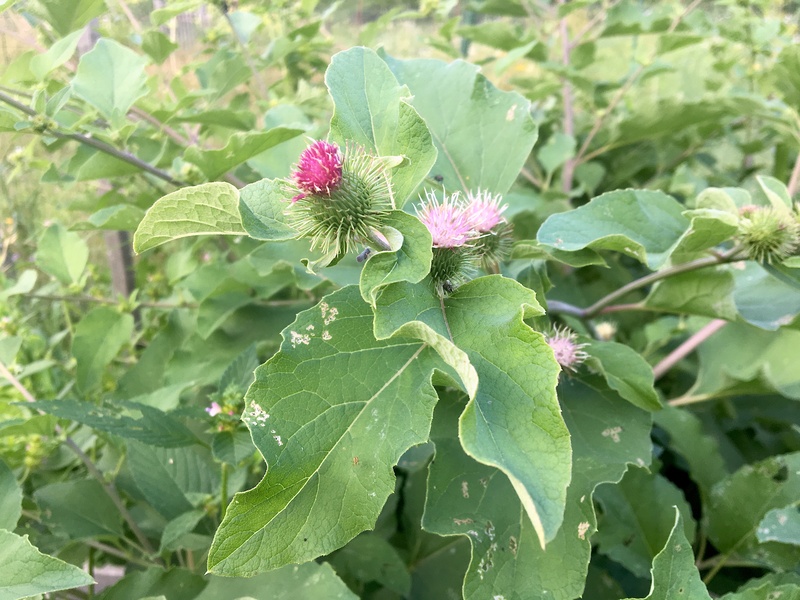 Our single burdock plant, pictured above, is above 5 feet tall and its leaves are much smaller at its apex than they were in the first year and they are also faded and drying in the hot sun. We won’t be digging up the root of this burdock yet because we need it to produce its seeds before we do that. The Japanese cultivate the root as a vegetable and call it gobo. The root is also used in tinctures, teas, and beverages like dandelion and burdock, a popular drink in Europe.